Stag beetles are the biggest beetles existing in Europe. They are a set of nearly 1200 categories of beetles in the scientific categorization Lucanidae. Lucanus Cervus is a distinguished class in Europe. Everyone will be surprised to hear the name of an arthropod as Stag Beetle and will be curious to know about the reason. One reason can be that the male beetle”s jaw resembles the deciduous horn of male deer. 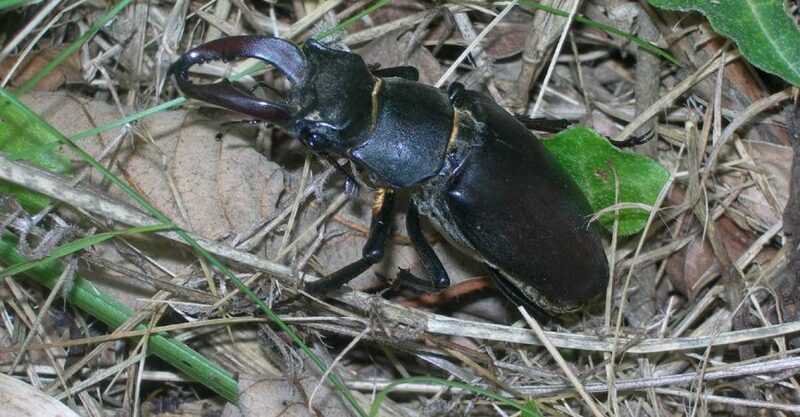 Pliny the Elder acclaimed that the Stag beetles were called as Lucanus by Nigidius as they were used as a charm in an Italian province, Lucania. Cervus is a genre of deer and thus another possibility behind the name can be the attributed to the combination of their scientific name along with Cervus. Stag beetles resemble the adult male deers in many ways. They scuffle with one another by employing the bones of their chin to get mastery over their preferred cohabiting areas, just like the deers struggle to win the females. Their combat will restrict not only for females, but also for edible materials like the fluids present in trees and rotting berries. Usually, they are not aggressive to man, regardless of their frightful visual aspect. Stag beetle females, while they are in the form of larvae, can be recognized from their males as they have bulky cream shaded ovaries with which can be seen along the epidermis, somewhat two-third below the hind portion of the larvae. Stag beetles, usually, don”t bite anyone, though they are comparatively bigger in size. A few of them grow larger up to 1.25 inches or further than that. The big unique antenna of the males contains various lamellate plates (Leaf like layers), similar to the rest of the representatives of the genre. They close on being frightened. The main purpose of these sensing appendages is to discover the chemical substance produced and released by the females. The two wing cases (Elytra) have four elongated white lines along with a single tiny bar respectively. The bottom part of the rib cage is camouflaged with copper colored thread like growth. Ahead of coming out as beetles, Stag beetles have to pass six years below the earth. They continue to be as larva for the best part of that time. On becoming mature in all respects, larvae stretch to a maximum of 8 cm. Nevertheless, the longevity of their life as a beetle follows a shorter period. Materialization of the larva starts from the egg shell, and on getting prepared to come out of it, a larva starts gnawing the outer covering. Right at that time, it will be most probably white in color, partially crystalline and the length will be only a few millimeters. The unique head in orange shade will evolve within some more hours. This is the starting point of the long journey before reaching adult beetle-hood. The larvae develop a huge stock of adipose tissue, which makes them a mature beetle,. The larvae continue to stay beneath the earth for five to six years using most of the time chomping the decaying logs. They move about among the neighboring dust and stale timber. While nibbling the log, subsequently it creates a chain of covered passageway and C modeled cubicles. The sheath covering the larvae begins to become stiffened in the process of their moderate growth and finally their epidermis will be thrown away. The protective covering of the head will crack and the larva slowly maneuvers out of its aged outer covering. As part of the development, this action happens four times in a larva”s growing period. In the extended larval phase, Stag beetles allocate the best part of their time below the earth”s surface. It mainly depends on the climatic conditions. Atmospheric conditions can halt this process in between three to seven years. These processes can take longer during the chilly periods. On completing the larva stage, they go away from the decayed logs, on which they were feeding on till this time, in order to construct a big egg shaped sheath in the dust. At this place they come into the pupal phase and lastly transform into mature beetles. Male Stag beetles fight with the other males to win the females. All along the period of reproduction, the male Stag beetles utilize their wonderful jaws as a cautionary indicator to other males. They move them up in an opposing and aggressive mode to compete with a rival. They prove themselves to be talented fighters who overpower the opponents and are able to stand erect upon their back limbs. Their jawbones are also termed as “Antlers” as they look similar and may use it as the antler; so much for stag beetles being named as such. Stag beetle males maintain their own domain and they travel through that in search of females in that region. At the eating places, males assemble near the females. It may be mainly due to the presence of the chemical substance produced and released into the environment. Feeding areas may witness fierce fights and the adversaries try hard to knock out the other by forcing them to lose their equilibrium. It lasts until the competition is eliminated and driven out. The longevity of the combat, the time interval or the amount of harm suffered by the opponents is not known precisely as supporting information available are inadequate or deficient. Though the proper information is not available, these battles are termed as ceremonial contests… But in certain groups, critical damages and even the end of their life can happen. This community of beetles is undergoing a transition phase. They have not yet arrived at a substitute plan of action. It is unfortunate that we don”t have the necessary information regarding the manner of conduct of differently sized males, For that reason, we can say that this category of beetles is the best experiential creatures to research on the highly fascinating breeding characteristics. The Southern part of the United States consists of a large quantity of Stag beetles. They can also be seen in plenty in the northern states all along the moderately hot spring seasons. They usually take up their residence in the timber and form their homes in the decaying remains of the tree having its root still attached to the ground. They become stronger by taking in the wet decomposing juices of logs and can attack and encroach in huge volumes when the conditions are favorable. 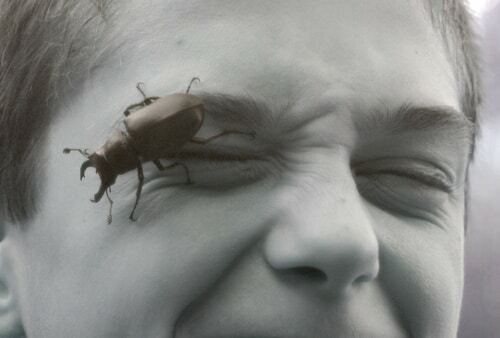 The Stag beetles may bite occasionally, if you try to grasp them. While considering their appearance, Stag beetles are, most probably, judged wrongly as ruthless. Actually, they are not commonly aggressive to man. Ahead of approaching adulthood, the larvae live by consuming the rotting logs for some years and at this phase; they can be the worst destructive force to trees as well as harvests. The matured male beetles will engage physically throughout the cohabiting time. If you want to dispel these beetles from your property, one effective preventive measure that can help you to reduce their proliferation is to prevent them from their combat for females for a limited period. By doing this, you will be able to interrupt and avoid their mating process. Britain”s biggest indigenous beetle that resides beneath the earth is the Stag beetle. Length of the matured females is about five centimeters and that of a few males is around seven centimeters. Stag beetles can move through the air using their wings. All along the wet climate, males may travel rapidly in search of females as they copulate in twilight. Though the females are able to fly, they seldom perform it. Instead, they discharge a synthetic substance in order to draw the attention of the males. Larvae are helpful as they consume large amounts of decaying logs, thus giving back valuable inorganic substances to nature. Jaws of male Stag beetle resemble the horns of a deer, thus the name, but female mouths, though small, are also powerful ones. Males utilize the antlers to overpower the other males all along the copulation period. Stag beetles have other names like Billywitch, Oak-Ox, Thunder-Beetle and Horse Pincher. A lot of superstitions exist in British, German and Greek mythology regarding the Stag beetles. Stag beetles can”t withstand chilly seasons and most of them pass away if they are not able to discover any of the moderately hot places similar to a pile of organic fertilizer. In short, the life span of Stag beetles is very long – seven years from ovum to attain maturity. Why Are Stag Beetles in Trouble Now? The stag beetles in London, with their large mouths and jaws is an extremely charming animal that many people love and recollect with fondness the first time they laid their eyes on this wonderful creature. Their fearsome looks belie their soft and harmless demeanor. These beetles are on the decline and are now placed on the endangered list because of steady loss of habitat, forest clearance, and the establishment of parks and gardens in their erstwhile habitat. These Stag Beetles fully rely on the decayed timber for most of their lives that they spend there, so that clearing their original habitats in favor of entertainment and commerce has had a shocking effect on their very subsistence. Moreover, their short life above the ground is fraught with many risks like, primarily, the human beings, cars, cats, magpies and what have you. The one thing that we, as human beings can contribute with are building wood stockpiles in our homes in order to offer them, abode, and make sure that our children, grandchildren and the generations that follow can continue to watch and love these lovely creatures.